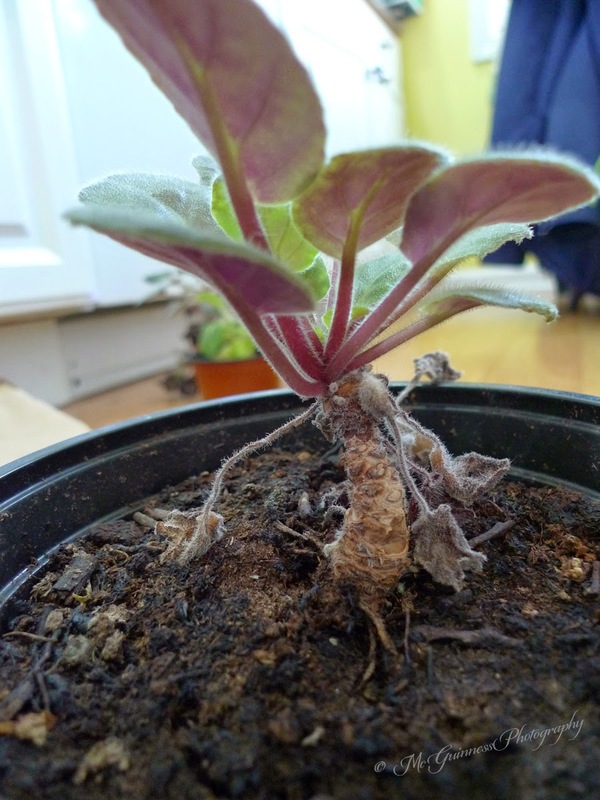 Winter is a good time for me to catch up on houseplant care. During the other seasons I am usually too busy with the outdoor garden so my houseplants are often neglected. My African violets in particular were in desperate need of repotting. They were beginning to resemble miniature palm trees, which is a major warning sign that attention is needed. They also haven't bloomed in a while, so a rejuvenation was on the immediate to-do list. I've broken the repotting techniques into two categories: stems that are 1 1/2 inches and less and stems that are 2 inches and more. See all that brown scaly "trunk-like" stuff? That all gets scraped off. And remove any dead leaves. 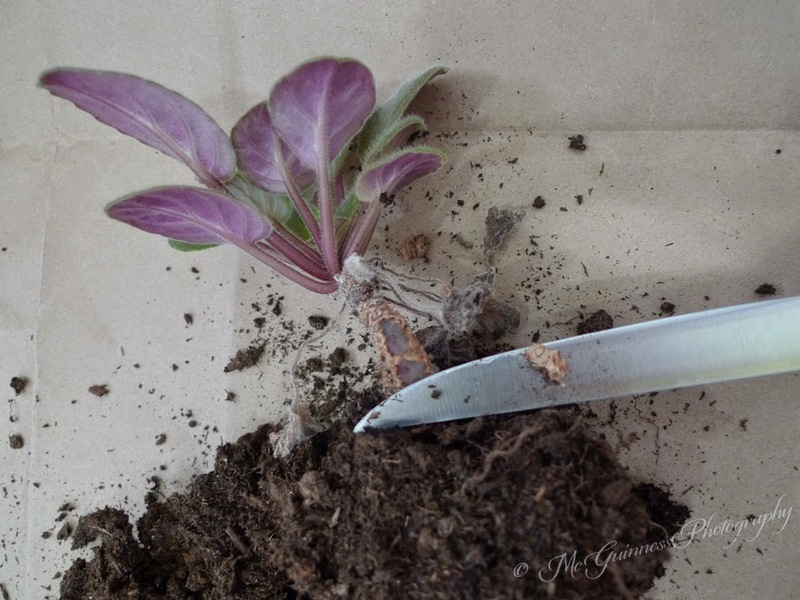 Remove the violet from the container and crumble away the excess dirt. In this case, I had to trim the roots off a little so the violet would fit in its new pot. Using a sharp knife (a pairing knife works better than the one I used), carefully scrape off the brown scales. Think of it as "peeling a carrot," and do not slice too deeply. After you have removed the scales from all sides, the stem should look like this (see arrow). No more brown scales! 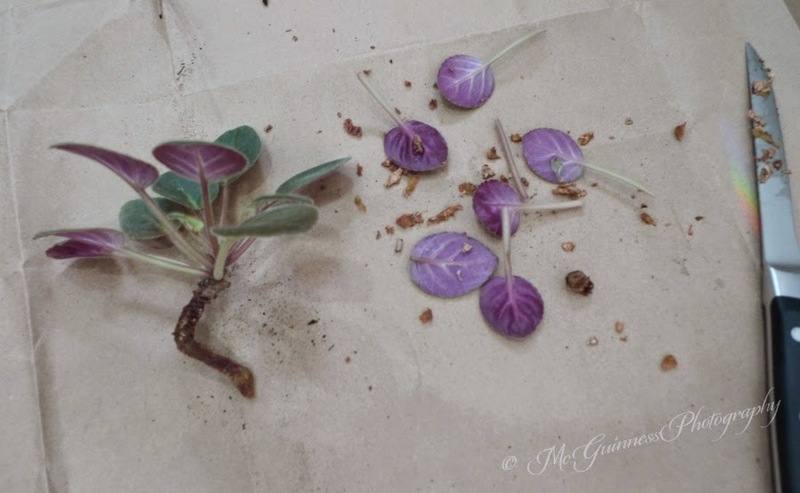 Put a little soil on the bottom of the pot and then place your violet into the pot. 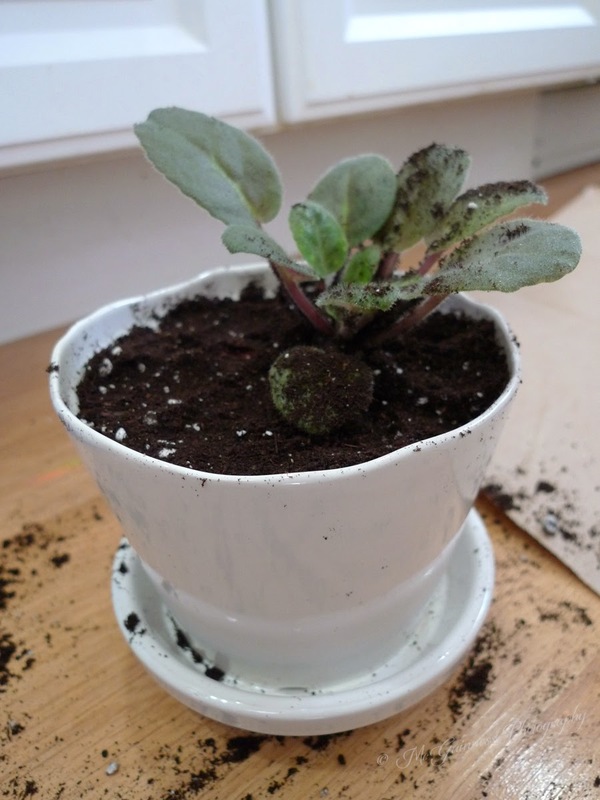 You want to carefully fill the pot with soil, which is tricky because leaves can break off in the process. None of the leaves should be covered in soil, because this can cause them to rot. All the leaves should be above the soil line. The stem that was just scraped is now buried which will cause it to form roots. Skip down to the "For Both" section to find out what happens next. Look at this poor plant. This is embarrassing that I even let it get this bad. See the offshoot that ended up dying? That's a sucker. It takes away energy from the main plant. In this case, it looks like aphids were jumping on board, too, which might have helped its demise. 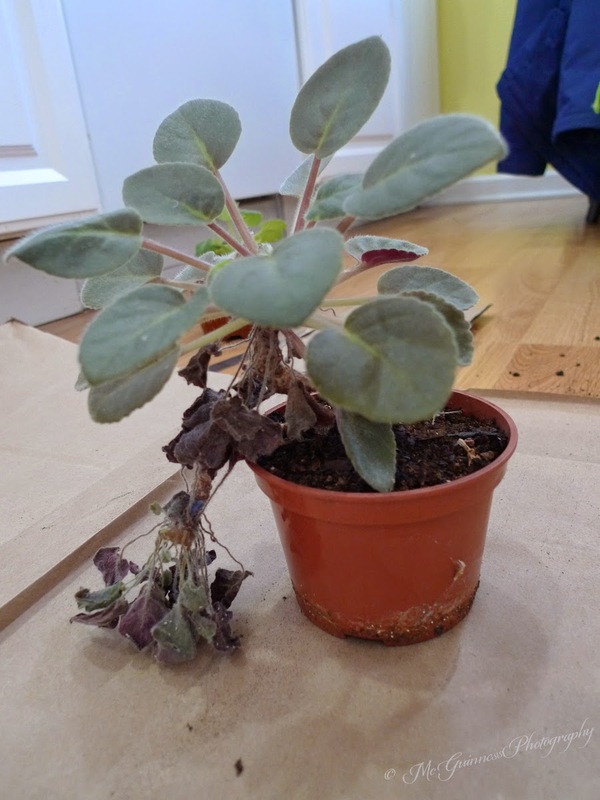 This plant was a violet emergency! In this case, because the stem was 2 inches long, I cut the root ball off entirely. I got rid of the sucker and some unhealthy leaves. (If you had a healthy sucker, that could be turned into a new plant using the same technique for stems 2 inches and longer). Some healthy leaves also snapped off when I was trying to clean the stem. In the photo above is a newly scraped stem with the discarded leaves and scrapings to the right. 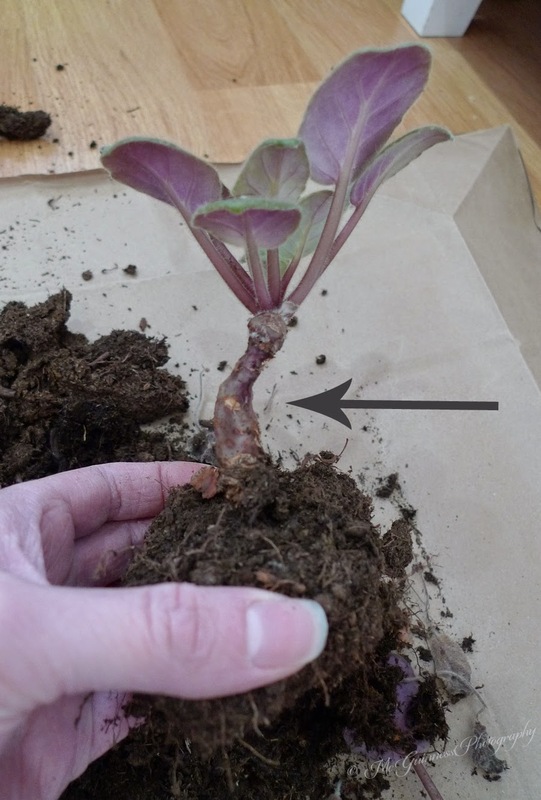 Fill a pot with a little soil and carefully stand up the stem in the pot. Fill the pot with soil and make sure none of the leaves are buried. (This will cause them to rot.) 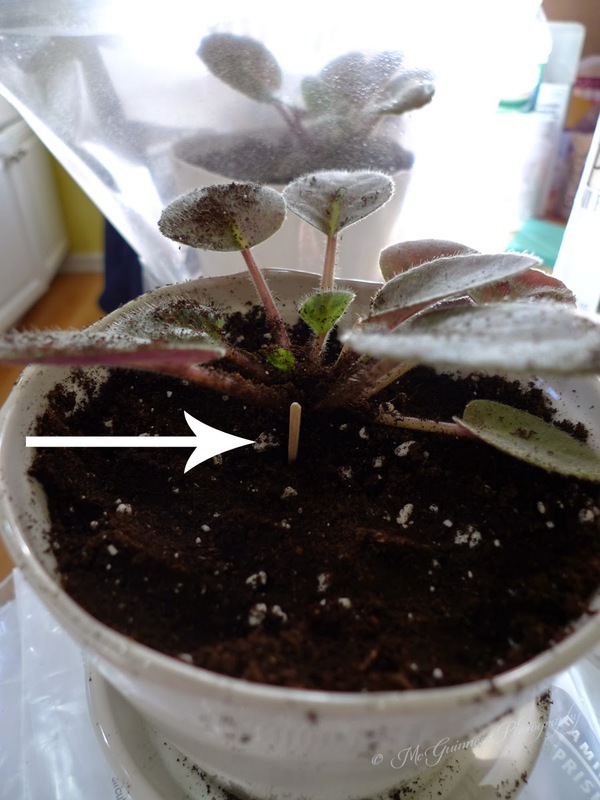 I added toothpicks (see arrow) to each side to help the plant stay in place and not be wobbly. Technically the violets that keep their root ball do not have to placed in a plastic bag, but I figured it was better safe than sorry. I put the plant in the bag with the sliding zipper seal at the top. Looking down into the bag, this is what your plant will look like (see above). 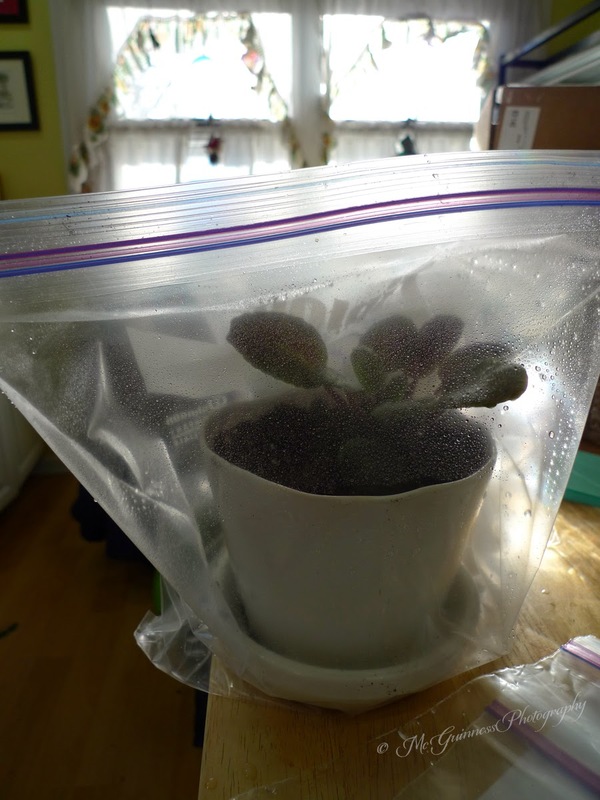 Add a little water to make the soil moist, mist the sides of the bag with water, and then close it up. You will need to open the bag weekly to make sure the soil is moist. There shouldn't be water collecting at the bottom of the bag. If there is, dump it out. The bag creates a humid environment that helps the plant rejuvenate and produce new roots. I placed my violets in bright, indirect light. It will take about a month for the plants to make new roots. I also wrote the day I transplanted the violets on the bag so I will remember when they can come out. 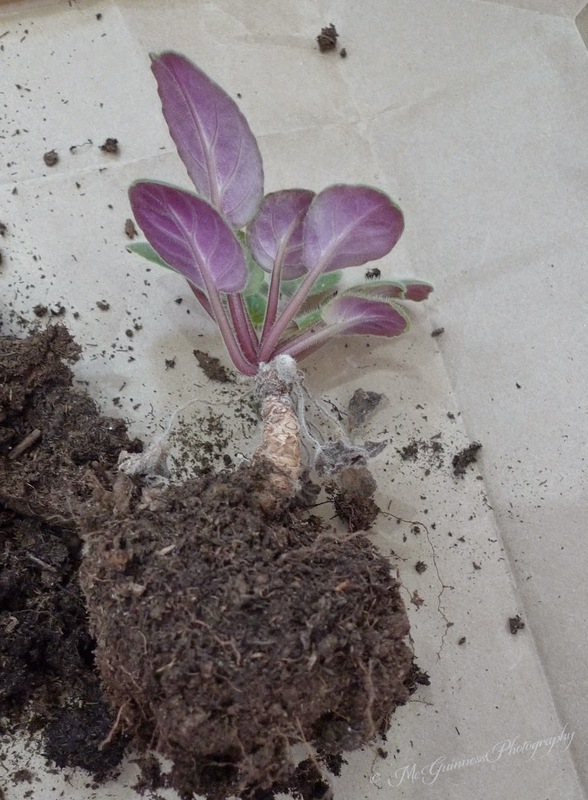 After a month has passed and it seems that the plant has rooted (you can test this by lightly tugging on the stem), open the bag and let the moisture evaporate. This helps the plant get acclimated to your indoor environment. 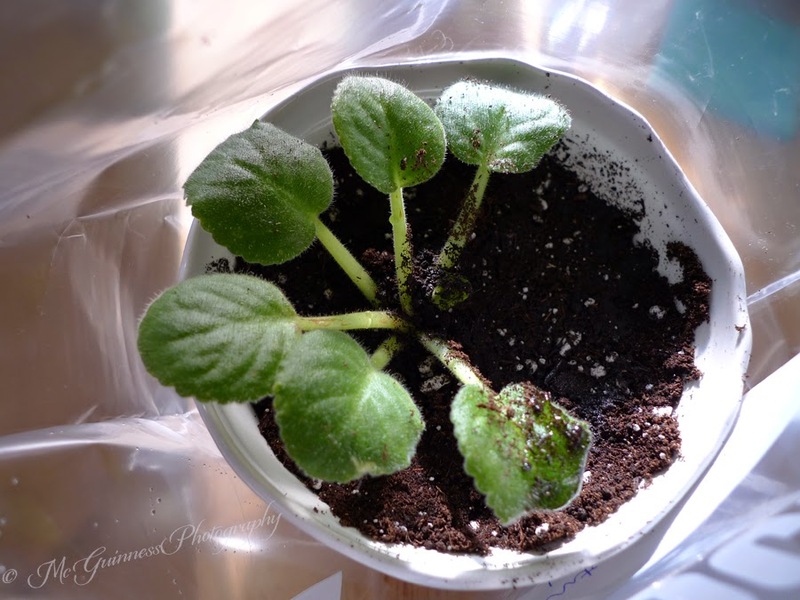 Violets that were transplanted with their root ball do not necessarily have to stay in the bag for a month. You can check after a week to see if the leaves look healthy. If they do, it's probably safe to remove it from the bag. Violets should be replanted yearly to prevent the "palm tree" look from happening. My confession: It's been several years since mine were replanted, and they still bloomed despite looking unshapely. But don't abuse your violets like I did. Luckily, mine were very forgiving. Yours may not be.